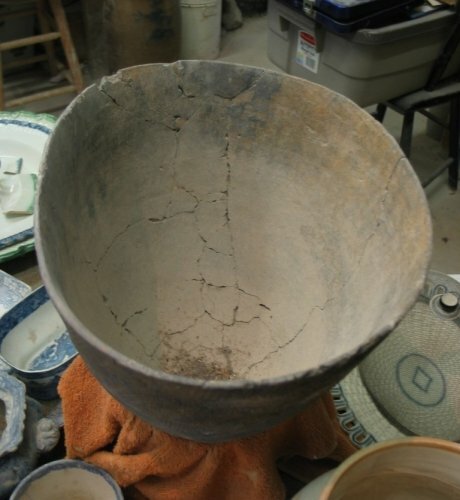 This vessel, referred to as Colono-Indian ware, was most likely made by Native Americans living in what would eventually become the Edgefield District of South Carolina. This piece – perhaps 1,000 years old – was coiled and hand-shaped, then fired unglazed at a low temperature. Earthenware such as this was not nearly as strong as the stoneware that later came to define Edgefield District manufacturing. Hi my name is Rebecca and I found what appears to be an old wash pitcher. I found it under the flooring in an old barn…. It has no markings on it but I was hoping you could help me to identify it…. I have no idea how to post a picture on here but I know that the barn was on the land of one of the oldest houses in Pickens S.C.